Blues Guitar Lessons, Chromatic Blues - Free Blues Guitar Lessons! This free blues guitar lesson is on the chromatic blues. 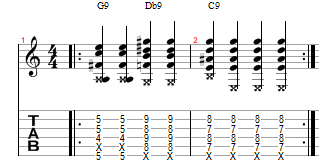 It goes with this chord sequence G9, Db9 and finally C9. Switch it up when playing this chromatic blues lesson. Start by moving the 1st pattern up or down x # of frets. Do this the each chord and don't forget strumming.